BBC Wildlife has selected its favorite photographs of the year — but not the ones taken by actual photographers. Rather, these photos were taken by automated camera-traps — and they're surprisingly awesome. 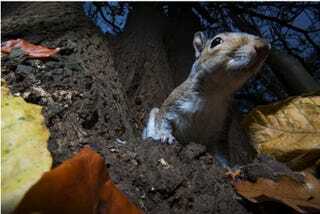 Above: Commended photograph: Grey squirrel, Wimbledon Common, London by Damian Kuzdak. This year saw a record number of entries, and an astonishing 877 photos made the final cut. In just five years this competition has grown into the world's most prestigious recognition of camera-trap photography. Here are some of our favorites. All images and captions via BBC Wildlife. Overall winner of the photography categories and Animal Portraits winner: Black rhino, Zambia by Will Burrard-Lucas. Animal portraits runner-up: European lynx by Laurent Geslin in Jura Mountains, Switzerland. Photograph: Laurent Geslin/2014 BBC Wildlife Camera-trap competition. Animal portraits commended: Young grizzly bear by Jonny Armstrong, Wood-Tikchik State Park, Alaska. Photograph: Jonny Armstrong/2014 BBC Wildlife Camera-trap competition. Overall winner of the research categories and rare species winner: Asiatic cheetah, Iranian Cheetah Society, Naybandan Wildlife Refuge, Iran. Photograph: Iranian Cheetah Society/2014 BBC Wildlife Camera-trap competition. New behaviour winner: White-lipped peccaries by Andrew Whitworth, the Crees Foundation in Peru. Photograph: Andrew Whitworth/2014 BBC Wildlife Camera-trap competition. British wildlife winner: Red fox by Jamie Hall, London. Photograph: Jamie Hall/2014 BBC Wildlife Camera-trap competition. Animal Portraits commended: Red fox, Wood-Tikchik State Park, Alaska, USA by Jonny Armstrong. New Behaviour commended: Ostrich attacking an oryx, Aus, Namibia by Sarah Edwards/Brown Hyena Research Project. Rare Species runner-up: Duiker, Western Area Peninsula National Park, Sierra Leone by Rosa Garriga/Tacugama Chimpanzee Sanctuary. Animal Behaviour commended: Pallid bat, Arizona, US by Beth Ruggiero-York. Animal Behaviour winner: European lynx and roe deer, Jura Mountains, Switzerland by Laurent Geslin.